The Very Narrow Aisle truck is perfect for optimising storage space and high-level order picking in very narrow aisles. 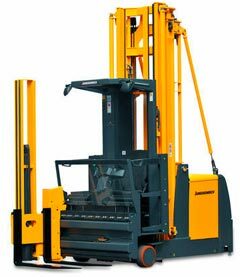 With lift heights up to 14.8 metres, load capacity of up to 1.5 tonnes, and the ability to work in very narrow aisles, down to 1460 millimetres, these versatile trucks can be used with wire or rail guidance. Training on the Very Narrow Aisle truck can only take place at customer's premises.